Opening a restaurant is sometimes about location, location, location. 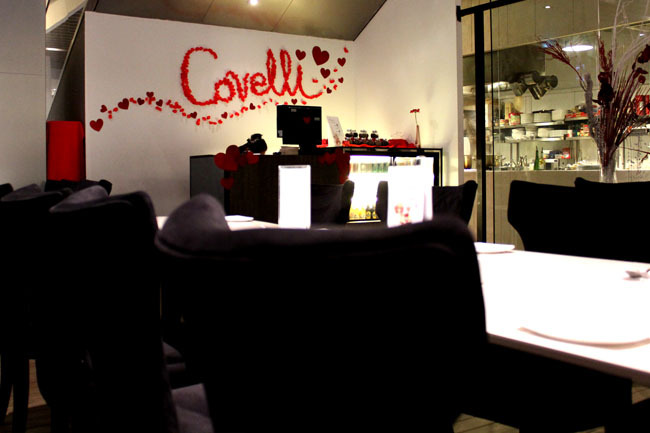 Covelli Italian Bistro & Wine Bar is a promising addition in the Orchard Road belt, but its site at the 2nd basement of Orchard Central (besides Medz) may leave it very unnoticeable. And I couldn’t find its entrance. Its contemporary monochromatic décor and mood lighting suggests that this is going to be pricey, but looking its menu suggest otherwise. A 3 course weekday lunch at $14.90++ is rather affordable, especially when it is quiet enough for lunch meetings and a romantic date. Started by Christopher Njo (who also once brought Roti Boy to Singapore), food at Covelli range from classic pizzas, pastas, Tortellini to pan seared duck gras and sea bream fillet. The starter of Pan seared Prawns on Semi Sundried Tomato Puree & Scallops on Onion Confit topped with Avruga Caviar Lemon Butter ($23) is a memorable one. 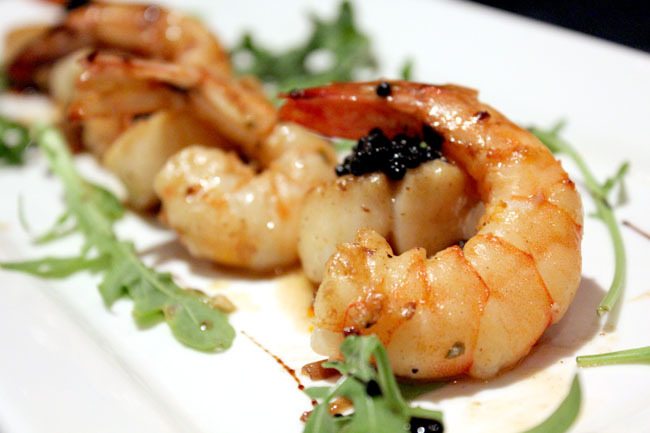 Freshly juicy prawns with semi-sweet puree work perfectly together, with the caviar adding a touch of class. I liked the Orata Con Pasta Stoglia, with Sea Bream Fillet wrapped with crispy hyllo on Butternut Pumpkin Mash topped with Tomato Salsa ($26). 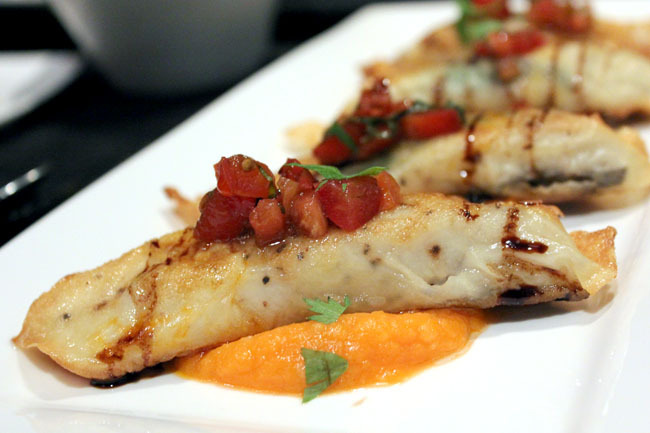 While biting into the fish, there is a paper-thin crisp giving it a layered and varied texture, with the mash nicely complementing and not overpowering the main. 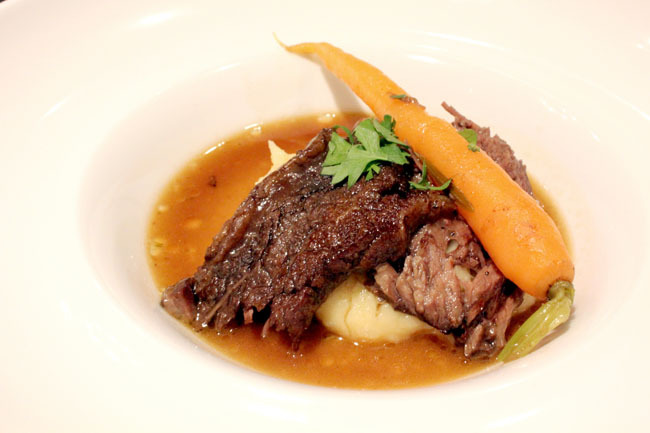 The Quarantaotto ($34) which is a 24 hours slowed braised U.S.D.A boneless Beef Short Ribs served with ide Truffle Mash already sounds exciting. The beef indeed melts in your mouth, though the broth is on the side of heaviness. 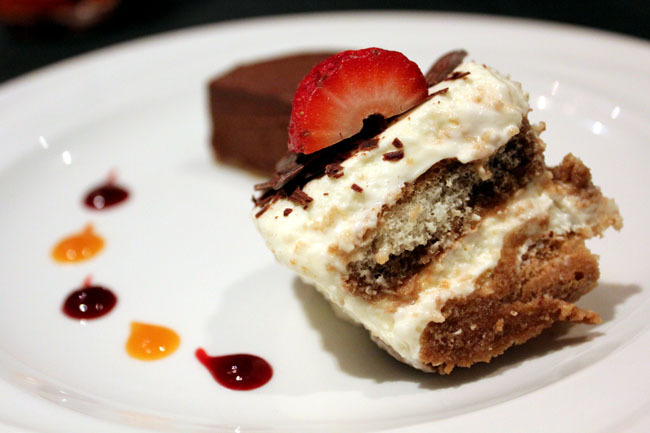 A pity the dessert, a traditional Italian Tiramisu ($12) topped with shaved Chocolate is rather ordinary and can do with a stronger touch of alcohol. If you are in the vicinity and crave for a cosy Italian meal, you know where to navigate to now.